This is the first film soundtrack I’ve ever played through twice in succession (apart from John Carpenter, of whom I’m a long-time huge fan). Klowns is an immensely enjoyable and fun movie, and this soundtrack couldn’t suit it any better. It’s bubbling over with crazy enthusiasm right from the start. 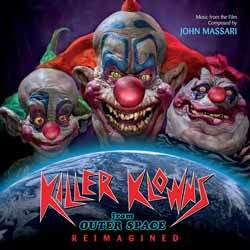 'Theme From Killer Klowns From Outer Space', by The Dickies, is an excellent Rock/Punk song. The style is close to Cheap Trick, but with horror/spooky sounds at the intro, and a great riff for the main piece which is reminiscent of the big top theme. The out of tune parts work really well to let you know – if you didn’t already realise from the words – that there is an uneasiness to whole. 'Knock my Block Off' is an Electronic Rock piece, and 'Muscle Kar Klown Jam' is a great frantic off-key band arrangement. But for me the outstanding track is 'Killer Klown March'. It’s a band and orchestra instrumental which is a fantastic main piece, with guitar, drums and keys prominent. There’s even a guitar solo. And then halfway through it changes its stance, becoming a nice moderate Rock piece with Metal undertones. Brilliant! 'Hidden Klown Ship' is a sharp string movement depicting a moment of discovery and intrigue. It also contains Psycho slashes with deep rumblings. 'Galactic Globe Theatre' has clown circus-type music; it then turns to a waltz. 'Shadow Show' contains an orchestral Tom & Jerry-like piece with parade-paced Arabian influences. 'The Inevitable' gives us a grand march suite. 'Klown Hideout' is a great example of how music can evolve in a single track. It starts with creepy music, a slam-sound introduces the strings and then drums. At that moment it turns into a band and orchestra number, before returning to the creepiness for the end. 'The Funhouse' has a rumbling foreboding atmosphere, but even this has a tune. 'Klownfrontation' is a keyboard-led Oriental Rock Piece similar in places to Big Trouble in Little China. 'Sketch For Sampled String Orchestra' is the longest piece. It’s like all the incidental music has been amalgamated in a single suite. There are also some alternative versions, such as a Hammond organ remix of 'Knock My Block Off'; a theatre organ version of 'Escape to Klown Cathedral'; and sampled orchestra versions of 'Hidden Klown Ship', and 'Mike & Debbie’s Discovery'. We also get the original demo version of the 'Killer Klowns From Outer Space', and 'Tell Me What is Real' – a new version of the theme which is slightly different in structure. You can see there is a good balance of band and orchestral work, with plenty of fun, dark humour and bare-faced zany craziness. This is a very fine work. Apart from the aforementioned John Carpenter, it is only the second soundtrack which I have given full marks to... and deservedly so!